In the 1970’s, artists from La Veta and La Junta joined together for an art fair. From that simple beginning, an organization grew to become what it is today, The Spanish Peaks Arts Council. 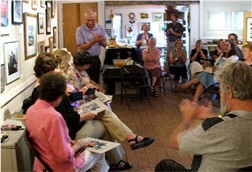 Four of those original founders reminisced with a gathering of guests at the SPACe Gallery. This is the first scrapbook, created by Nancy Christopherson. Already the Historian! Margie Bradley, Cindy Pierotti, Pam Pemberton, Nancy Christofferson. Everyone is asking Margie about an important fact from the past. Nancy provided the many “Visuals” for the presentation including a remarkable macrame´. Pam gave a wonderful oral history. 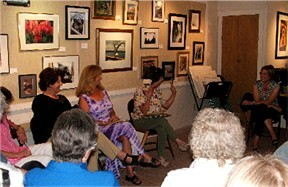 After the presentation, guests enjoyed talking about many aspects of the past and present. A very good time was had by all. Yummy refreshments were provided by Ellie Mellott. There are many scrapbooks with photos and news stories from the first few years of the Friends of the Arts but due to the lack of a Historian, there isn’t much about SPACe in the way of scrapbooks. The founders were each given a matted photo of one of the early art fairs and an engraved paperweight. 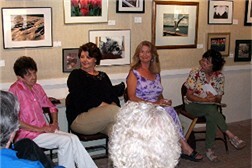 We are sad to report that one of the founders of the art community in La Veta, Margie Bradley (pictured on the left), passed away. 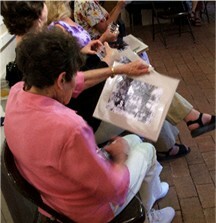 A memorial service was held June 13, 2010 at the La Veta Community Center.